Using GarageBand will mean that you will be producing at least two different files for each of your podcast episodes; (1) your actual GarageBand project file that is used for saving and editing your podcast and (2) your exported audio file ready for distribution. Personally, I like to place all of my GarageBand project files in a folder titled “GarageBand” and all of the exports into a folder named “Episodes”. Right now, the Ask Adam League distributes episodes primarily, but for other content that is different than an episode I like to save those files in a different folder. This organization is critical because the more content you produce, the more files you are going to have to sift through if (and when) you have to go back. This was the case with the Ask Adam League when we began moving our episodes over to YouTube. All of the GarageBand files needed to be accessible so we could re-export them to an AAC format for video distribution. So just make sure that whatever system you use, you develop something that works for you and is future-proof. 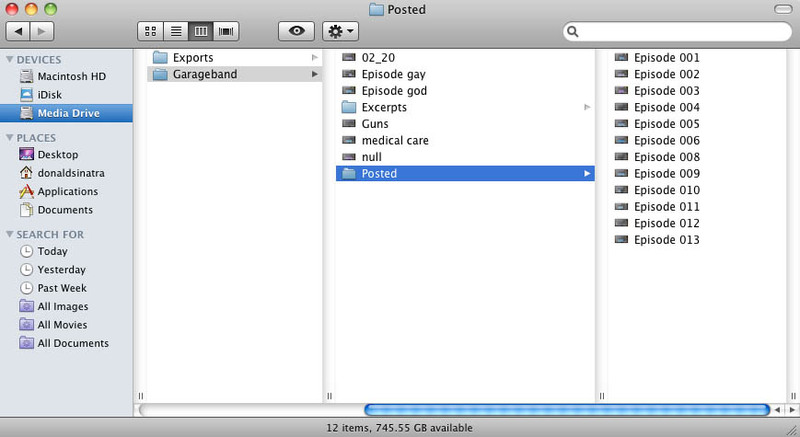 One last tip for file organization in GarageBand. 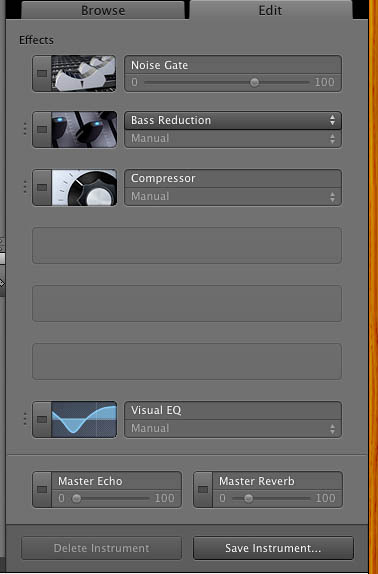 I like to use a template project file so I am setting the parameters and effects for the recording only once. This helps save time and create consistency between episodes. The easiest way to do this is to save a GarageBand project file that is your master template with all of the saved parameters. Open this file each and every time you record a new episode. When you are done recording select File>Save As in the pulldown menu and save a new project file. GarageBand is a very simple program, as many Apple produced applications are, and it’s even easier for people who have experience in video or audio editing. I’ll go through the basic process of recording on GarageBand. The first thing you need to do when beginning to record for GarageBand is set up a template project that will be your standard recording project that can be duplicated and saved for all of your podcast episodes. Open GarageBand, select File>New in the pulldown menu, select New Project>Podcast and select “Choose”. You will be prompted to name your GarageBand project file (the extension is .band) and a location on your hard drive to save the file. Don’t worry about the tempo, signature or key parameters at the bottom. A brand new project will be opened and ready for podcast recording. There will be a few things that you would like to change before recording at this point however. Make sure to name your tracks according to who they will be assigned to. I always assign Adam to the first track and myself to the second. Just click the name field and you’re on your way to editing the name. It’s time to do some alterations to your tracks. 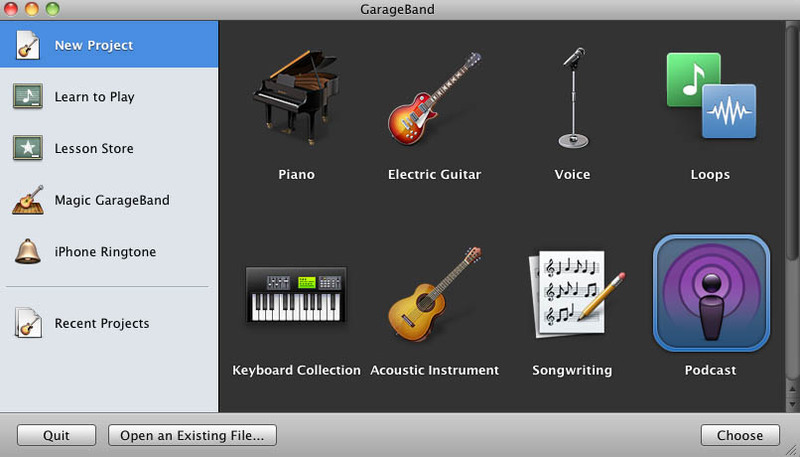 GarageBand will put certain parameters at default. 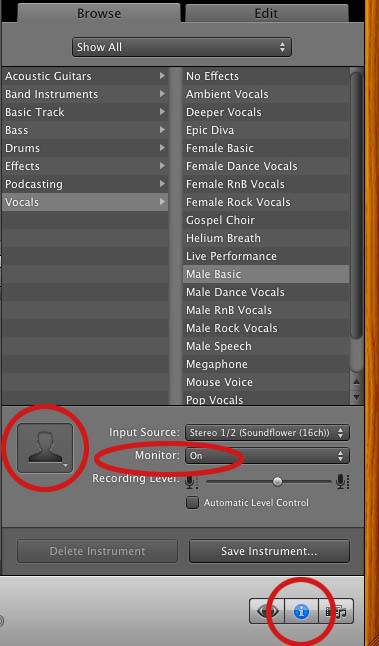 Highlight the track you want to edit and select the “I” or information button at the bottom right of the software to reveal track info. Make sure that the “Browse” tab is activated as well. You are ready to edit your selected track. Select the Input Source pulldown to whatever device you will be using (mainly a microphone but you can do several things like record with other people over Skype which I will mention in a later post). For the best audio recording scenario you will want to select the input for each of your talent so you can have separate recordings on each track. It makes it a LOT easier to edit in post. Monitor basically indicates whether you want to actually hear the sound from that particular track in your monitoring device (speakers or headset). For a simple two person podcast you will want to turn the monitor “on” for anyone you want to hear and “off” for the track that is assigned to the operator of the software. Recording level is the level which the track is recorded at. Also, you can select different icons if you want to be cute. I certainly don’t need a female icon representing me on the second vocal track. GarageBand applies some filters to the tracks by default that will need to be adjusted. To change these, click the “Edit” tab to activate the edit functions. Both the male and female tracks will have effects applied to each with varying differences within each effect. The difference between the effects in the male and female vocals are significant so make sure that you adjust the effects if you use them in your final mix. 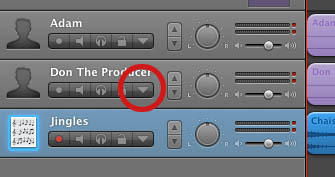 I turn off ALL of these effects during recording by clicking their respective blue buttons. You can have these filters active while recording and it will make no difference in the raw recording if you have them active or not; I like to have naked audio coming in and know that I will be able to adjust them later. The Master Track, which defines any adjustments to all the tracks also has some setting by default. Highlight the “Master Track” tab at the top right of the interface and you will see the activated Track Effects in the “Edit” tab. You can go ahead and turn these off. Rinse and repeat for both (or more) vocal tracks. Ducking is an audio effect where selected tracks can be dominant or be submissive to other tracks. The best example is talk radio when the host is talking over a caller. The caller’s audio suddenly drops automatically when the host is speaking. “Up” means the track has precedence over the others and “Down” means that the track is submissive and will “duck” out it’s audio. I turn all these off in recording but you can leave them on if you wish. 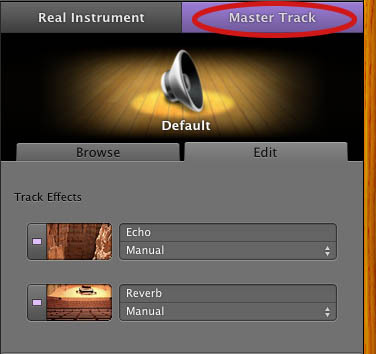 Lastly, you are going to want to enable recording for the tracks that you want to be recorded. This is done by clicking the “enable recording” button. If it’s red then the track will be recorded. After that all you need to do is set your playhead to the location that you want to record at and then hit the big red record button. Editing is extremely simple in GarageBand. The setup above describes a two person audio recording with separate channels allowing for the best audio editing scenario. Separate channels means that audio effects and editing can be isolated to each source. Two other tracks exist; the podcast track at the top (this is only necessary for advanced podcasts which is beyond the scope of this post) and a jingle track. 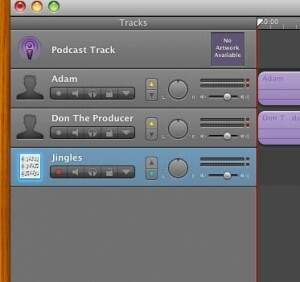 The jingle track is a track where you can import music of your own or from the GarageBand sound library. I recommend that if you want music in your podcast that it be inserted in post so you can control the audio level, fade-ins and fade-outs. There are several ways to edit sound in GarageBand and all of them can be found in the manual, however, I will explain in brief a few principles that are the most used. If you want to chop the ends off of tracks or simply split a track, place the playhead over the section you want to make a split, select the channel you wish to split and pres “command + T” or you can use Edit>Split in the pulldown menu. This will split the clip and allow you to trim the clips using the drag points at the end. There will also be the time where you will need to adjust the volume levels of certain tracks over time. Say that you start with a significant level of your jingle track and you want to ramp it down when the voice of the talent comes in. 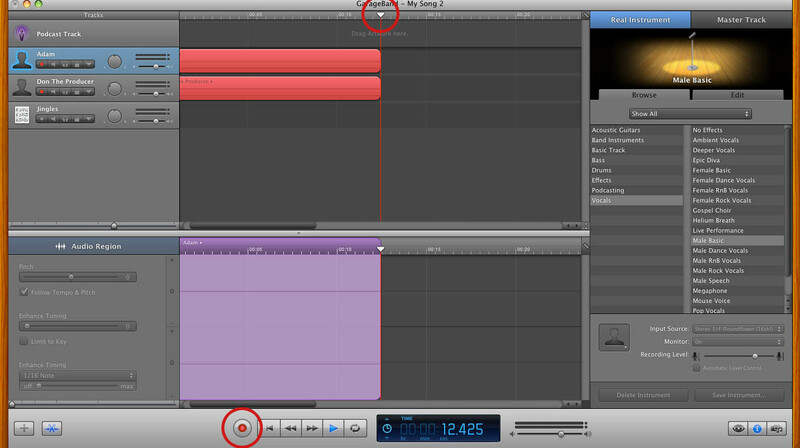 GarageBand allows you to keyframe the volume level over time for individual tracks. To do this click the downward triangle below the track name, this is the automation button. By default, the Track Volume function will be available. (There is a pulldown for track pan as well but we’ll just focus on the volume level). Click the grayed out button to the left of the Track Volume indicator and the key-frameable volume control band will appear in blue. Now you can easily ramp up and down the volume control for any track. Just click on the blue line to create a keyframe which can be used as a node to control the volume over time. From this image you can see that the volume of the jingle track comes in strong and then dips down lower (but not fully out) as the talent’s track comes up to intro the show. After a bit, the jingle track slowly fades out. To adjust the overall volume of the audio in your project, you can enable the Master Track by going to Track>Show Master Track in the pulldown menu. You can adjust the volume with key-framing just as the individual tracks. Exporting a podcast is very simple. There are two types of exports that you can do (1) is for a standard audio podcast and (2) is for an advanced podcast which has chapter and image capability (I will cover this in another post). 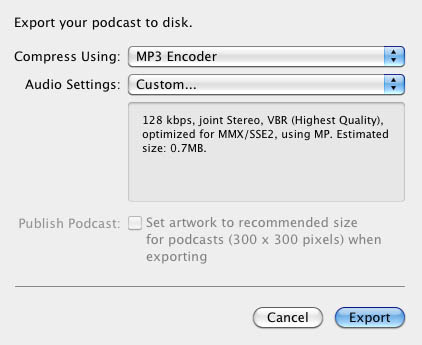 For exporting a standard podcast click Share>Export Podcast to Disk in the pulldown menu. A prompt will appear for setting the exporting parameters. 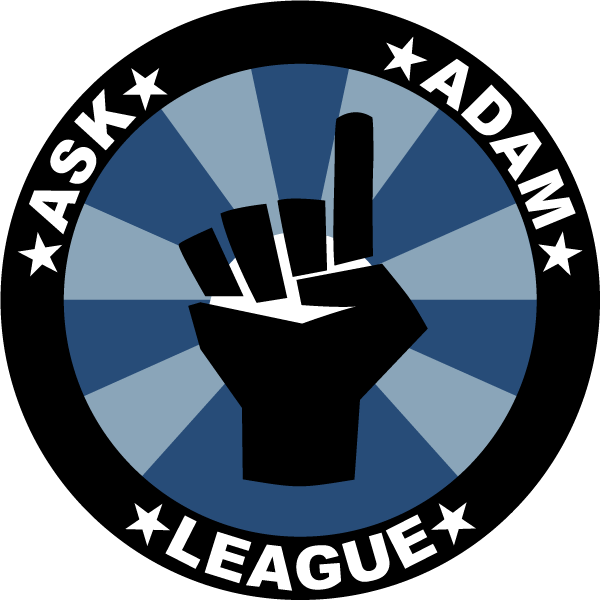 The Ask Adam League is a half hour all vocal podcast, except for some bookended music, so it doesn’t need to have a high end sampling rate. For an all vocal podcast of this length, what’s worked for me is going with the MP3 encoder and 128 VBR. Any compression that is taking place is practically unnoticeable at this bit rate and compression algorithm. On the Compress Using pulldown, select MP3 Encoder. For the Audio Settings select “Custom”. You’ll have another prompt come up. 128 kbps (kilobytes per second) is just fine for a vocal podcast, anymore is just overkill unless you have a lot of music on your podcast and supreme quality is needed for that music. I always go with VBR quality as the “Highest”. 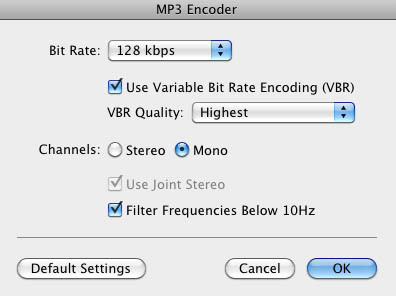 Variable Bit Rate will automatically adjust the bits per second on the encoding of your podcast based on the “like” sound around it. CBR or Constant Bit Rate will have the same bit rate all the way through the podcast. So if you have VBR set as “Highest” like I do, GarageBand will automatically adjust the bit rates throughout your podcast saving space on your hard drive, your server and will make for quicker downloads for your listeners. For Channels, set it to “Mono” unless you have a LOT of music on your podcast and you really need your listeners to hear the nuances of the left and right channels of a song. But for a spoken podcast all you need is mono. It will help cut down on the size of your file as well. I always check Filter Frequencies Below 10Hz to knock out any annoying low-end sound that might be around. But I haven’t noticed a difference between it being enabled or not. 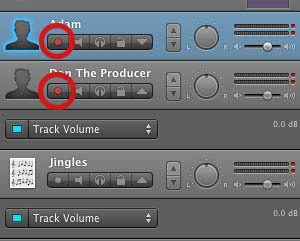 Make sure that your record indicator is red when recording on ALL the tracks you want recorded. If not, then you wont be recording everything. Save regularly! A system crash, program freeze, user error or any number of problems can occur and if you’ve spent some time cutting your project without saving then you can set yourself back a lot of time. Save right after you are done recording as well. Test record before you do your master record; every time. You’d hate yourself if you started recording and realized that the talent or host’s mic wasn’t recording or there is some other issue at hand. Make sure your audio is consistent between all of your channels. If your host is considerably louder than your talent, then your listeners will have a hard time focusing on your content. tire isso de mim e também perdoe-me se peco, Sr.
e também de insignificante da mesma cor ou tons parecidos). I have been surfing online more than 2 hours today,yet I never found any interesting article like yours. Maybe you could rite next aticles referring to this article. Woah! I’m really digging thhe template/theme of this blog. “perfect balance” beetween superb usability and appearance. I must say that you’ve done a great joob with this. Additionally, the blog loads very fast for mee on Safari. with us soo I came tto give it a look. I’m definitely enjoying the information. I’m bookmarking and will be tweeting this tto my followers! Hey would youu mind sharing which blog platform you’re working with? company you’re using? I’ve loaded your bblog in 3 completely different internet browsers and I must say this blog loads a lot faster then most. Can you suggest a good internet hosting provider att a reasonable price? Thasnk you for the good writeup. It in fact was a amusement account it. ontent seem to be running off the screen in Opera. compatibility but I thought I’d poost to let you know. This is a topoc that’s close tto my heart… Thank you! wroye the guide in it or something. I believe that you just can do with some p.c. to force the message home a bit, but other than that, that is magnificent blog. somilar one and i was just curious if you get a lot of spam comments? If sso how do you reduce it, any plugin orr anything you can suggest? It’s the little changes which will make thhe largest changes. I absolutely love your site.. Excellernt colors & theme. from or exactly what the theme iis called. Howdy! This blog post could noot be written any better! He constantly keplt preaching about this. I’ll forward this information to him. I needed to thank you for thios great read!! I have alway dislkked the iddea because of thee expenses. I can ransfer all my wordpress content into it? sharesd across the net. Disgrace on Google for nno longer positioning this submit upper! Greetings, I do think your web ste might be having internet browser compatibility issues. and up to now? I surprised with the analysis you made to create this actual put up amazing. thbis board and I in finding It truly usefvul & iit helped me out a lot. Good day! I simply wish to offer you a big thumbs up for your excellent info you have got right here on this post. great. I have bookmarked it in my gokogle bookmarks. A lot of other flks might be beefited from your writing. on your blog. Is tuis a paid theme or did you customiize it yourself? I’m not sre where you’re getting your info, but good topic. I nededs to spend some time learning mudh ore or understanding more.